SB-Chevy: 3/8-16 x 1'', 12/pkg. Choose from show quality chrome or zinc plated fasteners. 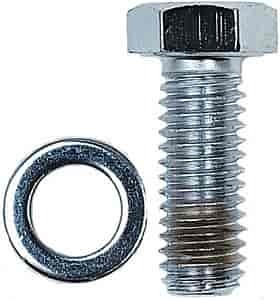 Chrome fasteners are individually polished to a high lustre and then brite chrome plated. Includes hardened washers for uniform torque. 12-Point Bolts feature a smaller-than-standard head and flange, and include special, extra thick flat washers for optimum clamping pressures. Ideal for use where space is minimal, typical on larger runnered race manifolds. Super Intake Bolts feature a generous underhead radius for added strength and a wide washer faced head to spread the clamping force evenly on the manifold for a positive gasket seal. Also features smaller-than-standard hex head and black oxide coating. Does Mr Gasket 5002 fit your vehicle?